Searching for Gravity Waves, Dr. Gary, reported on mysterious bright blobs that real professional astronomers see on their images and what they think they are. Now as you recall, we reported on our own mysterious blobs in the recent September 12 and September 16 post. It turns out that the real blobs, according to an article published in The Astrophysical Journal, are really Lyman-Alpha blobs, and have been speculated on for 15 years now and are just now being understood. Remember from some of our previous posts that the descriptor,Lyman Alpha, refers to the first quantum mechanical energy transition for neutral hydrogen, which occurs at wavelengths of 121.6 nanometers. A cloud of neutral hydrogen will absorb radiation at this wavelength and jump to a higher energy level and sometime later will radiate this same wavelength in some random direction. Now in the earlier universe, this radiation will be red shifted to longer wavelengths due to the expansion of the universe and if these clouds of gas are at various cosmology distance from us, the red shifted radiation can differ widely and be spread over many, many wavelengths and this effect shows up as a "forest" of spectral lines here on Earth. If the radiation is received here at say 800 nanometers, just into the infrared, the wavelength would have been stretched 800/121.6 = 6.58 times and the red shift z = (wavelength observed)/(wavelength emitted) - 1 = 5.58, which would be mean the radiation came from a very, very distant cloud of gas. Thank you so much Dr. Gary, for keeping us up on the mysteries of bright white blobs! Science Squad Gravity Guy, Ken, reported on the search for dark matter and how alternative theories of gravity (MOND) are still hanging on, especially given the lack of experimental evidence for some type of particle dark matter. Apparently, now a team of astronomer from Case Western Reserve University, have discovered a new correlation which fits the galactic rotation curves very well without the introduction of any dark matter. So, I guess we will have to wait and see, but for me, the dark matter conjecture is also supported by other lines of evidence, including the measurements of the cosmic microwave background, so there are converging lines of independent measurements that are explained by the presence of dark matter and support the need for dark matter as part of the universe. Finally, a note from Still in Control, Expert, Gene, reported on a fun topic of the Ig Noble Awards. 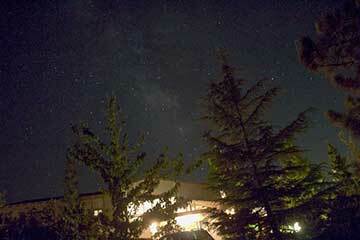 Ok, let's get back to the astronomical observing at Black Star and the Candy Store. 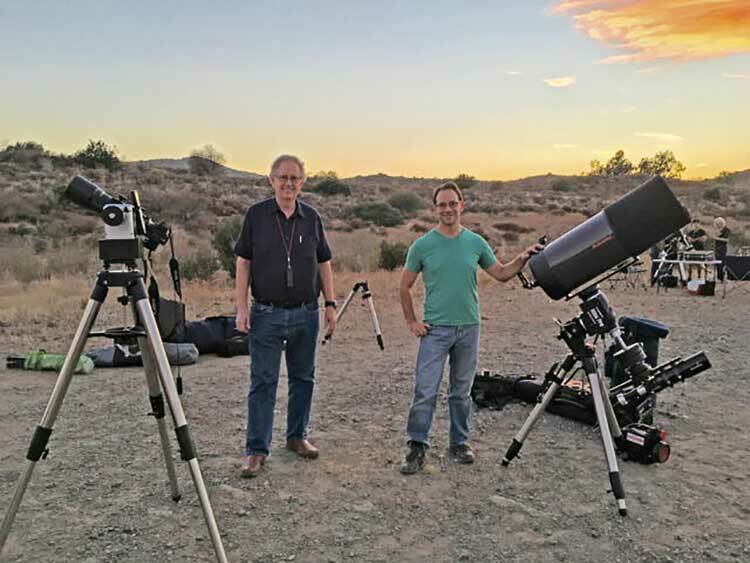 Well, it was a clear summery night and OCA President, Steve, introduced us with a green laser pointer to the current night sky, as we set up for a night of observing. Resident Astronomer Peggy and I set up in our usual location and met up with Mad About Mars, Eric, who set up his big scope, while I just have my little 600mm telephoto and Alt/Az mount. See the photo. So, all that was exciting, but my observing plans for tying to get a light curve measurement of the eclipsing binary star, Algol, and my first attempt at getting a picture of an asteroid, Ceres, failed miserably due to some sort of alignment error. All my images, none of which I can verify in the field, were off center by a bit more than a degree and therefore not in my camera field of view. I rely so much on my computer control to get the scope pointing in the right direction and I guess some of our experienced amateurs who navigate by various visual star hopping methods can have better luck. I was especially disappointed in not getting an image of Ceres because I had to wait around and shiver as it got colder and colder as the night wore on, until Ceres came up above the horizon. Oh well, the life of the amateur! Anyway, better luck was had the next night when I met up with Mad About Mars, Eric at one of his favorite dark sky spots, the Candy Store on Ortega Highway. Wow, that is really dark and only about 23 miles from the observatory and good roads. I had set two observing goals for the evening. First, since I didn't want to wait around for asteroid Ceres to rise, I elected to point at asteroid, Pallas, a slightly dimmer target and again try to get Pluto in the field of view. The frames with Pluto, including the 4 and 5 minute exposures, were latter found to have bad star trails due to inaccurate tracking. At least analysis with astrometry.net confirmed that Pluto location was indeed in the camera field of view. The 3-minute exposure seemed to have better tracking performance and I'll analyze that photo later even though the exposure time might not be long enough to get dim magnitude 14 Pluto. I haven't done any more analysis on those photos yet and instead concentrated on the 1-minute exposures used on Pallas, magnitude about 9.5. Astrometry.net again confirmed that Pallas, if visible or not, was at least in the camera field of view. 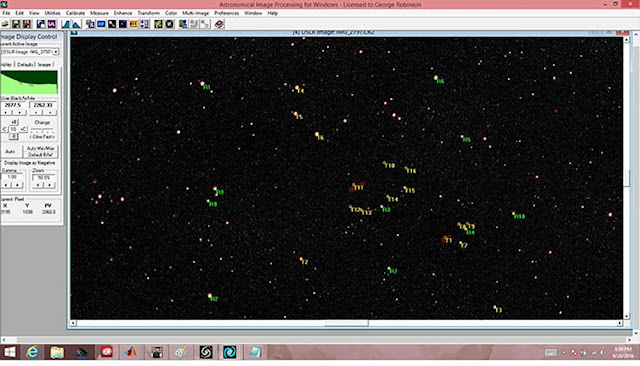 Then to get the exact RA and Dec of objects in the image, the AIP4WIN analysis tool was used to overlay the star chart directly on top of the bright stars in the image. See below. 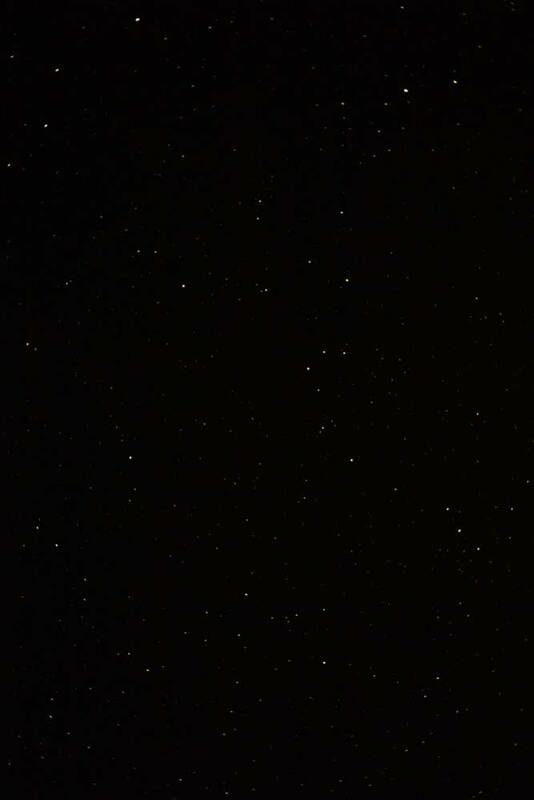 Selected 10 reference catalog stars and rotated and scaled camera image so all reference stars (circules) lie right on top of imaged stars. Now, we can go directly to the reported RA and Dec for Pallas and see what is at that location. Wow, nothing is there! What is going on? Is Pallas too dim to show up in the image. 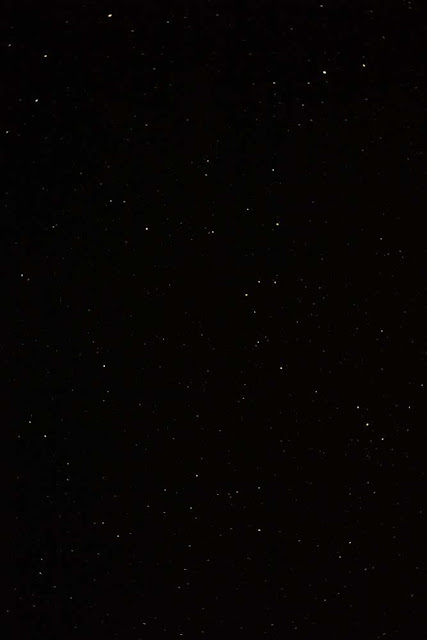 Well, I checked a couple of reference stars and they just happened to be magnitude 10 stars and I could find dozens of nearby stars in the image that because of the few counts in the camera pixels had to be 2-3 magnitude dimmer. So, Pallas with magnitude 9.5 should be there. But where was it? Just in case you can see the darn asteroid, I've pasted the image below. I considered that maybe the timing of the images was off and that would cause the predicted position of Pallas to be off. So, I checked the camera clock and yes, it was off, from standard time and was in fact running 1 minute 17 seconds fast. Ok, maybe that's the problem. But, no, when I updated the star catalog position to account for the time difference, the resulting change in predicted position with respect to the background stars for Pallas only changed by a few arc seconds. Darn, that was not the problem. So, I'm stuck with another mystery and will have to wait for the resolution to appear. In the meantime, Mad About Mars, Eric, sent his preliminary image of the Helix nebula. He had taken multiple timed exposures at the Candy Store and stacked them and got a very impressive image of the quite dim Helix nebula. Great job and thanks for sharing, Eric! Well, I am pretty bummed out about what is going on with the Pallas investigation and luckily while waiting to resolve the issue, Working in Malaysia This Week, Irina, posted this great picture of the Lychee Martini she was enjoying. Thanks for that, Irina! I think I could enjoy visiting Malaysia. Are you listening Resident Astronomer Peggy? I'm almost sure if I could look in that martini glass, the answer to the Pallas investigation would arrive. When can we pack our bags, cause I'm getting thirsty.